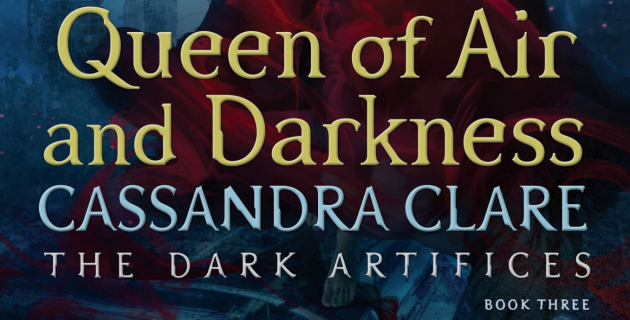 Guys, Cassandra Clare’s Queen of Air and Darkness is released in seven (!) months! We are getting closer and closer to December 4 and the wait is becoming better yet also worse. Cassie’s publisher Simon & Schuster recently launched the Shadowhunter Army, a monthly newsletter “containing important messages from Cassandra Clare, classified intelligence briefings, vital missions, and rewards for loyal service.” Shadowhunter Army members (soldiers?) were treated to an exclusive Queen of Air and Darkness snippet yesterday so I am sharing it with you today. This is is going to pull at your heartstrings so prepare yourselves! *clutches chest* WHAT ON EARTH IS GOING ON? HOW DOES TY WANT TO DO THIS?? There’s no link to this snippet yet, but Simon & Schuster/Riveted by Simon Teen is “working on archiving back issues on Shadowhunters.com so new subscribers can read through them.” As soon as there is a link I’ll add it to this article. This looks really cool, but why do they have wings?? I have a question about Julian. In LOS we saw a bit of his darker side multiple times, but a big debate is about whether that was just his anti-hero/slightly immoral side naturally, or if the curse was influencing his decisions and thoughts. Emma also said that the curse would make them stronger before it made them destructive, so could that be why Emma wasn’t having thoughts as similar and questionable as Julian was, because that’s the way he is all the time? C: The curse is absolutely affecting Emma and Julian in different ways, mosty because they are different people who respond to circumstances and stress in very different ways. They both have some troubling coping skills that could be referred to as dark sides. Julian is prone to thoughtful calculation and deploying strategic untruths, whereas Emma is prone to bouts of violence, an obsession with revenge, and borderline masochism in her training that has left her permanently scarred. I think one reason that Julian’s behavior is noted as morally gray while Emma’s isn’t is simply because Emma lives in a society of warriors, a society in which the inclination and ability to commit physical violence is in many ways celebrated and valued. That isn’t to say that Shadowhunters don’t care about strategy, but it is to say that they have a society where Emma is celebrated for her single-mindedness, even singled out as the most promising young Shadowhunter of her generation, rather that looked upon with concern. No one looked at Emma when she was growing up and said, “Wow, this orphaned kid sure is beating the crap out of herself in training. She also has a wall dedicated to revenge and murder. Maybe she isn’t okay.” Instead her behavior was admired. It didn’t finish its sentence. Emma had seized up Cortana and lunged forward, slamming the blade into the knight’s throat. It made a wet, squelching sound. Pus-colored blood sprayed from its wide mouth; it staggered back, but Emma followed, twisting the hilt of the knife. Emma doesn’t just kill this faerie, she is so overcome by rage that she twists the knife in his body to cause pain as well as death. In Lady Midnight, Emma was already driven by an obsession with revenge. Her big plan then was to find the person who killed her parents and murder them. So is her violence with the knight affected by the curse, her upbringing, a natural reaction, or some of all those things? We don’t know yet because we don’t know how the curse operates yet and that in true in Julian’s case too. Would he have manipulated Annabel if not for the curse? Hard to say. He was in an awful position and trying to save his family and in fact, all Shadowhunters. What does it mean to make a bad choice when they are no good choices to be made? Mostly what it means is that it tells you something about the characters making the choices. So we know that under duress, Julian turns to scheming and Emma turns to violence. Is either the best way to respond? No! Absolutely not! But this is a trilogy about people dealing with extremely difficult circumstances. If characters do not at first make mistakes and then learn from them, they are stagnant characters who do not grow — either to become better, like Gabriel Lightwood, or worse, like Nate Gray. In sum, we can’t currently know how much of Emma’s violence and Julian’s scheming ways are affected by the curse and how much they grow naturally out of the anguishing emotional shock both characters endured as children. I’ve seen people say they wish Julian was still the way he was when he was twelve, uncomplicated and cheerful. Well, so does Julian, I bet! When he was twelve, Julian went through a damaging trauma and didn’t have a lot of support in the wake of it: in fact, crushing responsibility fell on him immediately and he had to struggle in secrecy just to keep his family alive and together. In LM and LoS, we see other characters noticing his capacity for manipulation and ruthlessness—the Seelie Queen, Kieran—but he hasn’t actually done anything all that terrible yet. We’re just worried he might because we know the awful position he’s in now that his worst fears are realized: Livvy is dead, and he stands on the precipice of the destruction of the rest of his family because of the curse. C: I don’t think is a spoiler to say these plot lines will be resolved, just as Jace and Clarys romance was resolved at the end of TMI. TDA marks the end of these characters as protagonists, just as TMI did for Clary and Jace. And similarly, Emma and Julian’s mutual love and its consequences are a catalyst for changes not just in them but in the Shadowhunter world. Never before that we know of has anyone seen the parabatai curse play out – now we will. how does Julian not realize Emma still loves him at the end of LM even tho she’s dating Mark? Because they were kissing by the attic in LoS before Emma said “Mark” and I was just confused how Julian didn’t realize Emma still had feelings for him. Did Julian just want to believe Emma loved Mark? Lately she’d been noticing a lot more things about Mark—the way the odd, faerie-influenced shape of his face was appealing, and the breadth of his shoulders under his T-shirts. She didn’t know why she was noticing those things, and she didn’t exactly like it. It made her want to snap at Mark, or hide, often at the same time. “You’re staring,” Julian said, looking at Emma over the knees of his paint-splattered training gear. She snapped back to attention. “At Mark—again.” He sounded annoyed. All throughout Lady Midnight, it’s clear that Julian is jealous of Mark in a way that he isn’t jealous of anyone else. Not just about Emma, but about Mark’s relationship with his brothers and sisters. Mark is everything Julian wishes he could be, but can’t be. Though he knows Mark has had a bad time of it these past years, he’s also resentful that the weight of all responsibility has fallen on him for so long. “Julian can have fun with them,” Mark said a little sulkily. “It was surrounded by Mantid demons when we went, so we have pictures of the inside but not the outside,” Mark said as Ty went to get the photos. “As for the demons, Emma and I took care of them.” He winked at Emma. She smiled, and Julian felt that short, sharp jab of jealousy that came whenever Mark flirted with Emma. He knew it didn’t mean anything. Mark flirted in that way that faeries did, with a sort of courtly humor that had no real weight behind it. But Mark could flirt with Emma if he wanted. He had a choice, and faeries were notoriously fickle … and if Mark was interested, then he, Julian, had no right or reason to object. He should support his brother—wouldn’t he be lucky, after all, if his brother and parabatai fell in love? Didn’t people dream about the people who they loved loving one another? That’s it for today! What do you think of this snippet and what do you hope for once you have Queen of Air and Darkness in your hands? Sound off in the comments below! One thing Ty should know about ressutections. They never turn out how you expect them to. Jace, Annabel, now Livvy. I’m scared. First about the wings on Emma and Julian, Clary’s dreams and premonitions often involved wings on Jace and Sebastion (Johnathon Christopher). I wonder if it is from one of her dreams. Secondly, if I remember correctly, the curse builds the power of the parabatai involved until they no longer recognize reality and kill those they love. I can’t remember if it said family, friends then each other. I would guess that they either make a deal with the Unseelie King or defeat him and use the book to destroy all parabatai bonds which may be the source of Clary’s premonition. Maybe the spell either kills all those with the bond or just knocks them out long enough for her to think she is dead. Yet, she tells Emma to keep swinging her sword based on her premonitions. It is like she is encouraging her to strengthen herself with the curse. So many possibilities! That is why I love the Shadowhunter world. I wish the movie had been better written. This world could easily rival Harry Potter. And, having a better movie to kick start that success would have been wonderful. We would go to theme parks and get out own personal steele! (Sorry if I spelled that wrong).